Hello and welcome to JT Hughes. 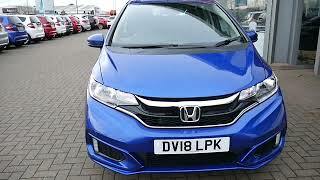 Today I'll be showing you around one of our used, approved Honda Jazz. This one is a 2018-plate 1.3 SE. It's the automatic, which is a 7-speed CVT box. This one comes in Brilliant Sporty Blue and it is in excellent condition. This one has 15-inch alloy wheels to offer comfort, and also convenience for cleaning. This one boasts front and rear parking sensors. The Honda Jazz is famed for its massive storage capacity inside with its very large boot and also flexible seating positions in the back. And those seats can fold down on a 60/40 split. And they can go absolutely flat, or you can lift them up and they will lock themselves into place, offering a large carrying capacity in the back. Now, this vehicle comes with daytime running lights, and also automatic headlights and windshield wipers. Take you into the front of the car, as you can see, this one comes in cloth trim, height-adjustable on the driver's seat, multi-functioning steering wheel. This one also has a touchscreen 7-inch display, which operates your hands-free telephone kit, and also your CD player. Air conditioning and your modern-day connection points are just stowed away underneath. Now, flexible finance is available on this vehicle, and you can also extend your warranty for a cost of £299 per year. In regards to this vehicle as well, service plans are available. But for more information on this particular vehicle, please contact JT Hughes of Shrewsbury.